Brazil is the largest country on the South American continent and the fifth largest in the world. 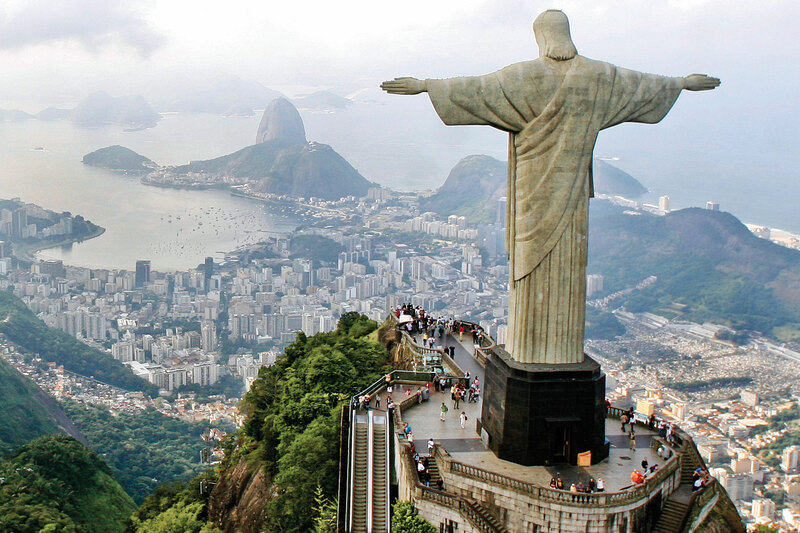 Home to a diverse population, Brazil is a tourist’s dream with so many things to do and places to see. Rio used to be the former capital of Brazil before Brasilia. You can pull out the swimming trunks and sun block as it’s is full of beautiful beaches and palm trees that capture the imagination of what the city has to offer. And if that isn’t enough, why not visit some of the landmark monuments the city has to offer; the Christ the Redeemer statue which stands as a tall as skyscraper building overlooking the city as a whole. Staying in Rio, it would be sacrilege to not travel to the home of Brazil’s national football stadium. The Maracana is steeped in historical tradition. Opening in 1950 the football stadium was designed not only as a home for the national team but to attract tourists from around the world. It once housed 199,854 people for a match between Brazil and Paraguay in 1954, a record that still stands today. It will once again be playing host to the greatest sports final in the world in 2014 when the football World Cup returns to one of its spiritual homes. Whilst Sao Paulo doesn’t have the beaches of Rio de Janeiro, what it does have is a vibrant city life. The wealth on offer attracted immigrants from an array of countries such as Germany, Italy and even Japan. Famed for their multiculturalism, why not take advantage of the world class restaurants on display and fill your bellies with mouth-watering food. If your fancy hasn’t been tickled enough perhaps foraying into some clubs and unleashing your samba dance manoeuvres may be required due to Sao Paulo’s nightlife constantly buzzing, just don’t forget to take bottles of water with you as you may work up quite a sweat. As one of the greatest natural wonders of the world, the opportunity to travel to Brazil and see the Iguacu Falls would leave you in awe. Situated near the borders of Brazil, Argentina and Paraguay the Iguacu Falls has been placed on UNESCO’s World Heritage list. Access to it would be done through the Brazilian city of Foz do Iguacu, which has an airport and hotels nearby. Despite safety standards being very reasonable diving at the edge of the cliff is strictly not recommended! The Amazon is the largest rainforest in the world and half of it resides within Brazil’s borders. Visiting the Amazon would certainly have you on high alert as predators would be on display such as Cougars and Jaguars, though they often come out at night for hunting purposes. Anacondas and Piranhas are just some of the deadly predators swimming in the river, so perhaps skinny-dipping is out of the question. But overall the canopies and greenery really add to the natural experience when seeing the Amazon and remains one of the star attractions of Brazil. Brazil is a wonderful country to travel to. Tourist destinations have a largely natural feel to them be it the Amazon rainforest or Iguacu Falls. The beaches of Rio de Janeiro will add to the relaxing theme that you will want to be apart of but this is completely contrasted by the allure of Sao Paulo. If you want to sink some cocktails, do the tango and explore the lavish restaurants of this electrifying city, be fully prepared for fun.